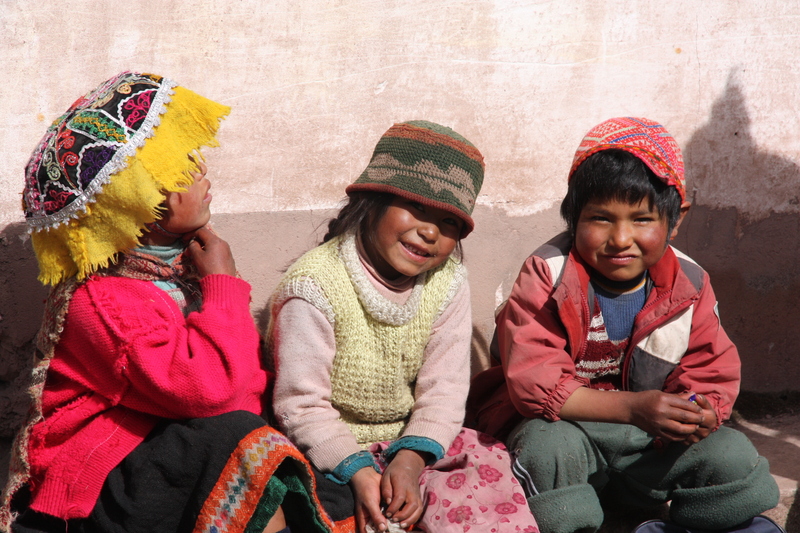 Day 3 on the Lares Trek—all downhill | Where to next? Day 3 had a late start—7:30 for breakfast and an 8:15 departure. We’re all so used to getting up early, that there was a little resistance to ‘sleeping in’. But Odon, our guide, assured us that if we descended too quickly we’d reach the village at the end of the trek and have too much time with nothing to do. As with Day 2, our wake-up call was cups of coca tea and washbasins placed just outside our tents. Then it was time to pack up our gear before a breakfast of pancakes—which are spelt panqueques in Spanish. The late start had some special benefits. 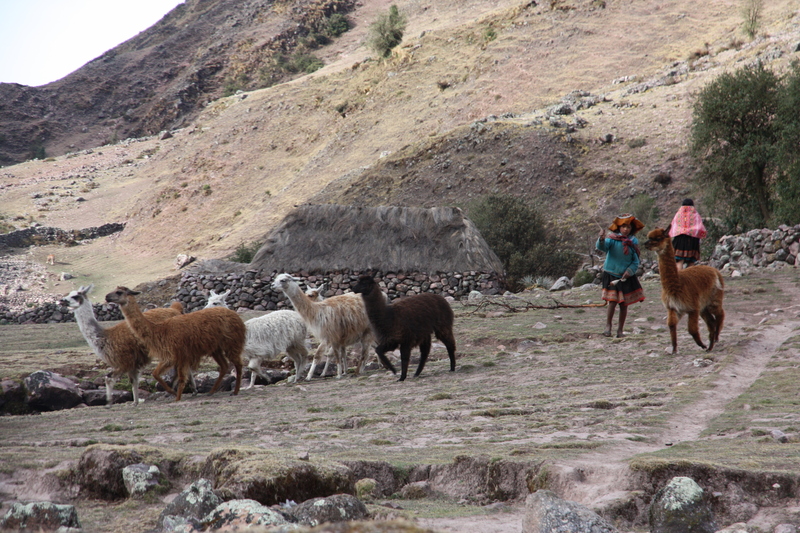 For starters, we saw the women of the village set out for the day with their flocks of llamas and alpacas. I suppose visitors to Peru think these women ‘dress up’ for the tourists, but their every day clothes are colourful skirts and shawls. And in spite of the chilly temperatures, they wear sandals without socks or stockings. Our tents were set up in the schoolyard, so we also got to see the children arriving for the day. Apparently the school may close soon. While there are plenty of kids in the area, most don’t come to school. They help in the potato fields instead. The children we saw were all quite young. Our support team used the school kitchen to prepare our meals, but it is really just a room with a table, some chairs, workspace and a cooker. The toilet block behind the school had four stalls—three long-drops and what we think of as a normal toilet (without a seat). Our trek this day was 8 kilometres downhill. There’s nothing easy about hiking down steep, gravely hills. Walking sticks help with balance and grip, and I think a person would be crazy to try the descent without something to hang on to. And the horses aren’t available on these stretches. They have their own challenge getting down. Once again, most of the occasional steps had high risers and loose rocks. Plus the Andes are full of streams so there was a lot of running water across the path. 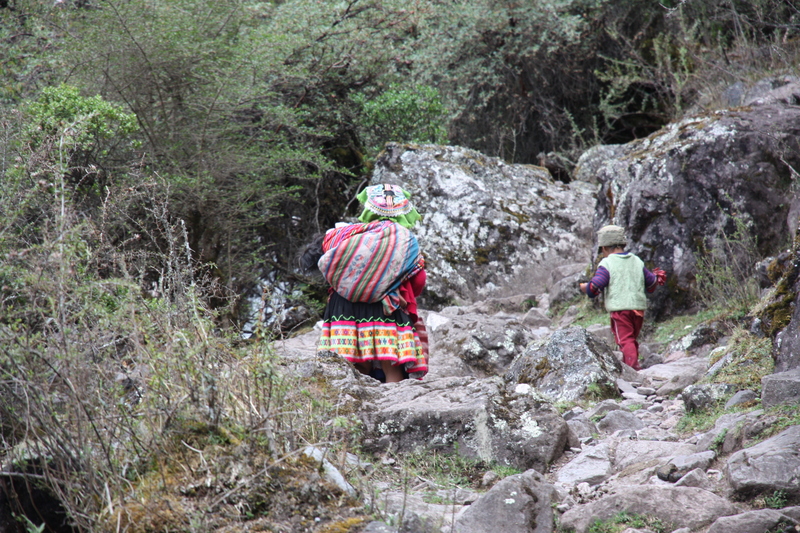 We encountered a few people on the path, including a group of women butchering a sheep, and a woman walking effortlessly uphill with her toddler tied to her back and an older child at her side. I just stared in disbelief, but was quick enough to get a snap. Of course, once again the scenery was sensational. As we got lower, there was a lot more plant life and I’ll do a separate item on flora. From many kilometres away, we could see our final destination in the valley below. At first I thought we were aiming for a green lake, but it was actually lush fields of crops. Lunch was served in the village and then it was our chance to say goodbye to and tip our support team (except Odon who would travel on with us for another day to Machu Picchu). Angie and I gave Francisco a bonus for being our horseman the day before. After our farewells, it was into a van and then on to a train to Aguas Calientes, the town below Machu Picchu. We were staying a hostel this night, with real beds and the best shower head we’d had since starting this overland. Pure luxury and most welcome given that we needed to be up the next morning at 3:30 so we could board the first bus to Machu Picchu.